It is not uncommon for estate planning to be the last item on the list when a couple is about to be married – whether for the first time or not. On the contrary, marriage is an essential time to update an estate plan. You probably have already thought about updating emergency contacts and adding your spouse to existing health and insurance policies. There is another important reason to update an estate plan upon marriage. In the event of death, your money and assets may not automatically go to your spouse, especially if you have children of a prior marriage, a prenuptial agreement, or if your assets are jointly owned with someone else (like a sibling, parent, or other family member). A comprehensive estate review can ensure you and your new spouse can rest easy. When a new baby arrives it seems like everything changes – and so should your estate plan. For example, your trust may not “automatically” include your new child, depending on how it is written. So, it is always a good idea to check and add the new child as a beneficiary. As the children (or grandchildren) grow in age, your estate plan should adjust to ensure assets are distributed in a way that you deem proper. What seems like a good idea when your son or granddaughter is a four-year-old may no longer look like a good idea once their personality has developed and you know them as a 25-year-old college graduate, for example. For most individuals, it is a good idea to obtain a new set of estate planning documents that clearly meet the new state’s legal requirements. Estate planning for Americans living abroad or those who have assets located in numerous countries is even more complicated and requires professional assistance. It is always a good idea to learn what you need to do to completely protect yourself and your family when you move to a new state or country. We are here to help you get fully settled in and build a plan to protect you and your family. 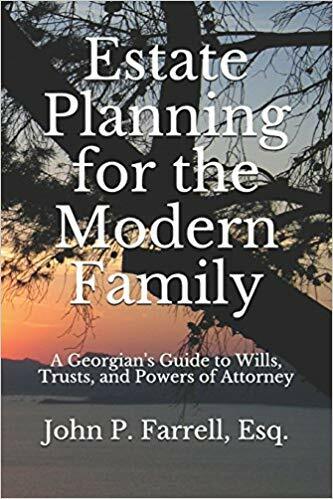 Contact us today at (678) 809-4922 or get a copy of our book, Estate Planning for the Modern Family, for more information. Previous Previous post: What do I do when my spouse dies?